Şefika Kutluer, deemed the "magical flutist," will be performing in Vienna on the 263rd birthday of Wolfgang Amadeus Mozart. The Concilium Musicum Wien orchestra conducted by chef Cristoph Angerer will accompany the concert at Haus Der Ingenieure on Jan. 27. 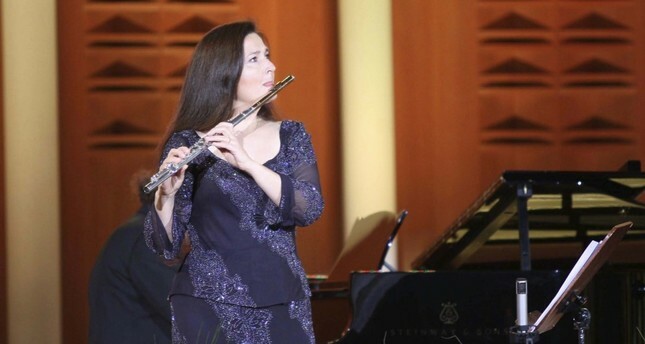 The magical flutist will be performing the famous Turkish March "Rondo alla Turca" at the concert and she will also perform at the Vienna Embassy in Turkey on Jan. 30. The Turkish artist noted that she was honored to be invited to perform this meaningful concert and added that she especially wanted to play the Turkish March, composed by Mozart, who was fond of Turks. One of the most important composers of the classical music world, Mozart's widely known as Turkish March is one of the greatest gifts given to Turks throughout history according to Kutluer. Kutluer noted that she will be celebrating Mozart's birthday by performing his works. Holder of the Austrian State Golden Legion of Merit, Şefika Kutluer performs Mozart's compositions pretty often. Working with trainer, Werner Tripp, who is deemed as one of the best performers of Mozart's works in Vienna, Kutluer also gave a concert with Sir Charles Mackerras, a conductor who is also one of the best performers of Mozart's works. Kutluer's "Mozart" CD was listed as one of the most successful CDs of the year by the American Record Guide.